Whenever I find myself in a situation where I feel I have to carry the conversation with folks I have just met, I bring up the Mothman. A few months ago, we dropped in on an in-law who was recovering from radiation and chemo treatments. He had other relatives visiting as well, including his 90-something mother. They are from south of here and are accustomed to driving through Point Pleasant - even used the Silver Bridge back in the old days. So, as we began to run out of things to talk about, I brought up the whole deal about The Mothman Prophecies (both book & movie). They, of course, were aware that the bridge had gone down long ago, but knew nothing of the craziness that attended its collapse. So they were fascinated by my ramblings. This weekend, at a baby shower for my stepdaughter, I ran into the old lady, again. She couldn't wait to tell me that, upon my recommendation, she had read the book and enjoyed it. "I didn't know there were such strange goings-on, so close to home," she said with a glint in her eye. "That's the kind of book that when you're done with it, you put it down and pick it up a few months later and read it all over again." Well, I don't know about that... But, I do know, that once I get started on the Mothman, I rarely stop until I have covered all the theories about what happened in Point Pleasant, West Virginia back in the mid-60s, including my own. I guess my enthusiasm overflowed its banks on that occasion, more than I had intended. All I had wanted to do was divert attention from talk about cancer to something I could get into with all the hyperbole I am accustomed to injecting into my favorite subject. Hey, why let facts get in the way of a good story... I suspect that John Keel, paranormal researcher and author of The Mothman Prophecies, also subscribed to that philosophy. Your faithful blogger (L) with Carol Allin, Walter Rhodes and Barbara Forster at the Mothman monument, Point Pleasant, WV. 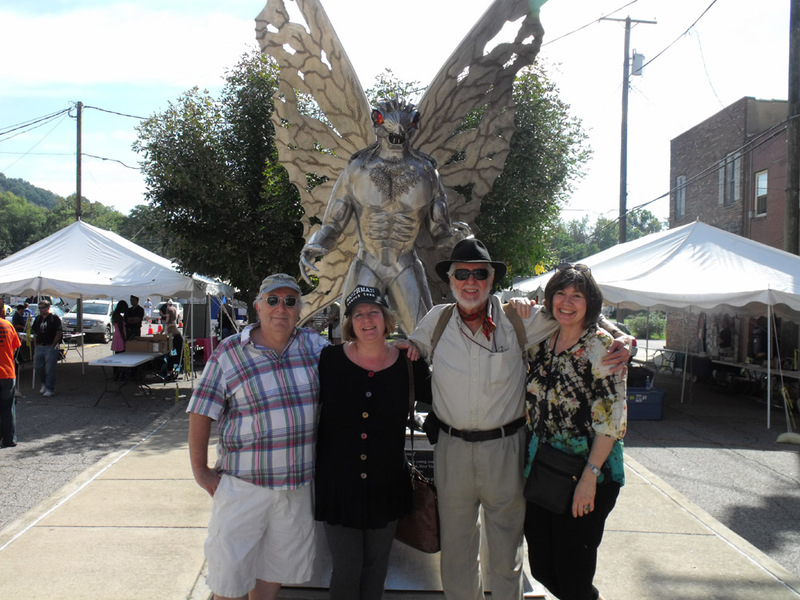 The 12th Annual Mothman Festival is coming up Sept. 21-22. A great day trip with a little adventure thrown in.